Congratulations to all of our teams who competed on March 3! To view the results, click the link above! The bad news: We live in a world with a lot of problems and a lot of people who need help. The good news: YOU can be a part of resolving those problems and improving peoples' lives by using your creativity! The Odyssey Angels program is a way for Odyssey of the Mind team members to use their creative problem-solving skills to help their community. One team and project will be selected to attend 2019 World Finals, where they'll present their project and their results at the Creativity Festival. KIDDOVATE!!! Way to place! 🤩 Rock on, MDDC!!! What a great World Finals- we are so proud of MDDC. Can’t wait to see what next year brings! Float and Banner Parade! Wowza, PENTACRAB! Dylan Outtrim is a rock star, x100! Where are youuuuu, Odyssey Alums? 🧐 Sign up in the alumni database today! IT’S WORLD FINALS TIME!!! GO MDDC!!!! Our friends at NASA - National Aeronautics and Space Administration will be returning to World Finals once again to teach our incredible problem-solvers about some of the ongoing Earth and space science that's being done at NASA. The 2018/2019 Long term problem synopses are out!! Which piques YOUR interest?? 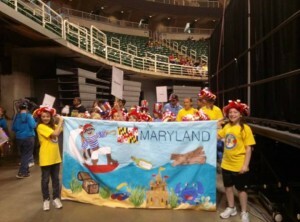 Maryland/DC Odyssey of the Mind | Powered by Mantra & WordPress.